Well...one thing's for certain...she isn't me. Who *I* am isn't important, Alcina is my creation, my alter-ego, my pseudonym. She came into being because on an early trip out in cyberspace I was required to register on a site: I was asked to provide a username and password. At first I typed in my own name, but then I worried about being a single female on the net, so I deleted it and considered my options. I needed a nickname to hide behind....fast! Other nicknames I'd seen around were of the "maSt3R oF diZaSt3R" variety. Not really me! I have always been very fond of Handel's opera Alcina, and indeed of the title character herself, so after barely a moment's thought my handle was born (tehehehehe....little geeky joke there!). © 1995 The New Yorker. Reproduced without permission Once born she took on a life of her own. 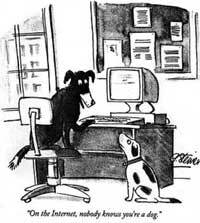 When the Internet first became mainstream there was a cartoon floating around of a dog tapping on a computer keyboard. The caption read "On the internet, nobody knows you're a dog". This is so true. Released from the constraints of being me, I could make Alcina anyone I pleased. People only knew about her what I chose to tell them. And what I chose to tell them need not be anything like who I am. The only known thing about her was that she was female. "Alcina" couldn't really be anything else! It's odd, but the gender of the person doing the typing is the one thing which is very difficult hide. You can have a completely none gender specific nickname, or even a gender which is specifically NOT you, but either way, unless you think about everything you type, your true gender quickly becomes apparent. It's nothing to do with subject matter, just how you write. There's probably a PhD thesis out there on this very interesting phenomenom - "Gender and Language"
My friends were a little concerned about fragmented personalities (just call me Sybil!) but the reality was that it gave me the opportunity to reinvent myself (and re-reinvent myself if it all went wrong!) without any danger to myself and without any need actually to adjust my own private life! Having stated that it doesn't matter who I am, Alcina is undoubtedly a part of me. Or, at the very least, a reaction to or against a part of me. If she weren't I wouldn't be able to be her on-line. We all have many facets, not every one of which we chose to show. We also have many potential facets. Who we are is a construction made out of what we were born with, and our life's experiences. Neither is necessarily dominant (you hear of people whose lives change after some...erm...life changing experience!). Consequently who we are (or maybe more accurately who we appear to be) is, in fact, a very fluid thing. Usually we fall into a comfortable and familiar rut, and this rut is us, I, me, id and ego. But occasionally the opportunity comes up to question just who we are and experience being, not who we are, but whomever we want to be. Once, on IRC, someone commented, "Alcina? As in Handel's opera?". I felt naked! I'd been discovered. The real me was about to be exposed. But I worried needlessly. Alcina had become someone so complete in her own right that she was the person they were communicating with, not me. They weren't interested in me. I was only the person who physically did the typing. Who I was was immaterial. Ultimately it doesn't really matter who Alcina is, the joy is that she is whomever she appears to be. Who knows, maybe one day I will become Alcina, but at the moment she is, most definitely, not me!